How to fix Windows 7 or Vista Boot errors – problems. Boot problems can be caused by several reasons, like power supply interruption, a damaged data cable, damaged boot device , wrong boot device order, virus attacks or after installing a new operating system. This tutorial will show you how to run and use the Windows “Startup Repair” (Repair Your Computer) option to fix these problems. Keep in mind that this tutorial is mostly effective when your boot device (e.g. hard disk) is healthy, your data cables are OK and you have specified the proper boot device inside BIOS settings (see Step 1). Info: An error occurred while attempting to read the boot configuration data". After you have installed a new operating system on your computer, you cannot boot into Windows anymore. You have accidentally deleted the active boot partition. How to fix Boot problems in Windows 7, Vista. In most cases, the boot problems occur because the system tries to boot from the wrong boot device. So before continuing to repair your system using this tutorial, check the boot order setting from Bios. Step 1: Ensure that your computer starts from the proper boot device. * The way to enter into BIOS Settings depends on the computer manufacturer. 2. Inside Bios menu, find “Boot Order” setting. This setting is commonly found inside “Advanced settings”. * If your computer has more than one hard disk, set the proper hard disk (the hard disk with the OS on it) as “First”. 3. Save and Exit Bios Setup. 4. See if your computer boots normally into Windows. If not, continue to Step 2. Step 2: Change BIOS Boot order to boot from your CD/DVD device. Windows 7 System Repair Disk. * The above media will be mentioned at the rest of this article as “Recovery Media” for brevity reasons. 2. In Bios menu, find “Boot Order” setting. This setting is commonly found inside “Advanced settings”. 3. Change the boot order to first boot from “CD/DVD Drive”. Step 3. Boot your computer from the CD/DVD drive. 1. Place the “Recovery Media” (Windows 7 Installation DVD or the System Repair Disk) on your CD/DVD drive. 2. Press Any key to boot from CD or DVD, when the corresponding message appears on your screen. How to fix your Windows 7 installation using Startup Repair. Step 4. 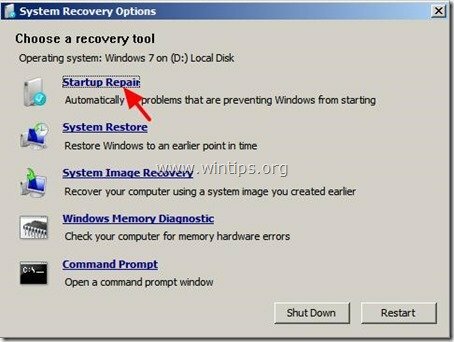 Repair your Windows 7 boot problems using Startup Repair. 1. Choose your preferred Language, Time and Keyboard settings and hit “Next”. 2. At the next screen choose the “Repair your Computer” option. “Windows found problems with your computer’s startup options. Do you want to apply repairs and restart your computer?”. If the above message appears on your screen, then press the “Repair and restart your computer” button to apply changes and restart your computer. Now check if the boot problems are fixed and you can boot to Windows normally. 3. At system recover options leave the “Use recovery tools that can help fix problems starting Windows…” checked and press “Next”. 4. Select the “Startup Repair” option. Now let the “Startup Repair” to check your computer for problems. Remove the Recovery disk from the DVD drive. Press the “Repair and restart your computer” button. See if your computer can boot to Windows normally. Attention: You have to run “Startup Repair” option two more times, before continuing to the next step because “Startup Repair” in most cases must run three (3) times until it fixes all problems. If the problem persists put your “Recovery Media” on the CD/DVD drive again and continue to the next Step. Step 5. Fix the master boot record using “bootrec” command. (With your “Recovery Media” placed on the CD/DVD drive boot to “Command Prompt”). 1. At the following screen, select “Command Prompt”. 2b. Next fix the System Partition Boot Sector and the boot configuration data. To do that, type the following command and press “Enter”. 3. Remove the “Recovery Media” from the CD/DVD drive and restart your computer. If your computer fails to start, continue to Step 6. How to fix Boot Configuration Data information. Step 6: Fix (ReBuild) the corrupted Boot Configuration Data (BCD) folder. 1. Scan your system for compatible Windows 7 installations and add them to boot configuration data (BCD) folder. To do that, you must boot with the “recovery Media” inside command prompt window, so type the following command and press “Enter”. “Scanning all disk for Windows Installations. Normally your system should load Windows without problems. How to change Active partition in Windows 7, Vista. select disk X (Where “X “means the number of disk that contains the Operating System – e.g. “0”). 4. Then type the following command and press “Enter”. 5. From the available partitions, select the partition that you want to make active (e.g. “partition 1”). Type the following command and then press “Enter”. 6. Finally type the following command and press “Enter” to make your partition active. 7. Close “command prompt” window, remove the “Recovery Media” from CD/DVD drive and restart your computer. 8. If your computer fails to start, boot from the “Recovery Media” again and run the “Startup Repair” (Step 4) and let Windows fix Startup problems. I'm facing same problem and the biggest problem is that my keywords are not working… So, i'm unable to go in bios as well. I tried esc, Enter as well to skip this but none of them are working..
Configuration is I3 6th gen and Gigabyte. @Anup: What is the model of your Gigabyte motherboard? Thank you so much, great step by step tutorial.